The AIS350 features a dual-channel receiver system for fast acquisition and tracking of both Class A and Class B AIS targets. The targets can be displayed on any AIS compatible chartplotter or radar display including all Raymarine A-Series, C-Series Widescreen, E-Series Widescreen and G-Series systems. 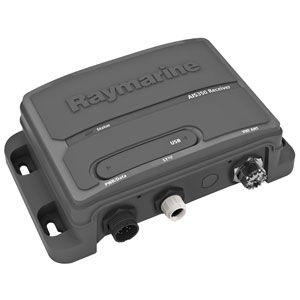 When used with Raymarine multifunction displays, the AIS350 supports Raymarine’s exclusive Buddy Tracking feature, which allows you to save AIS targets of interest with a special icon and “friendly” name. Buddy tracking makes it easy to spot the boats of friends and family out on the water, or to identify other vessels-of-interest with ease. 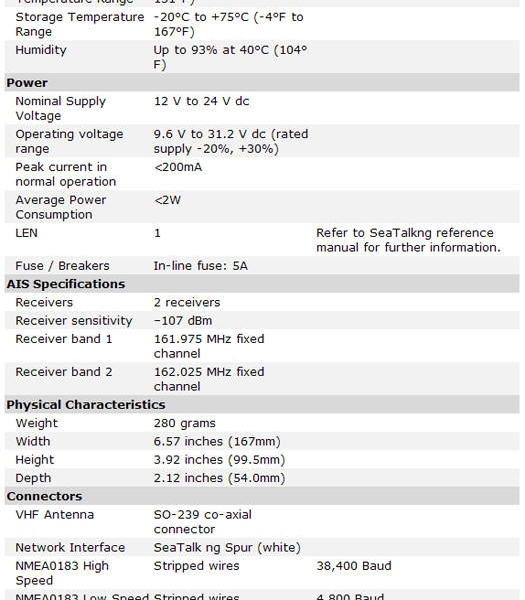 AIS350 is also an excellent choice for coastal ship-spotting enthusiasts, harbormasters, and other users needing an easy-to-install, and highly reliable AIS receiver for use with a PC-based navigation or vessel tracking system. AIS350’s standard USB 2.0 (Universal Serial Bus) connection makes for 1-step plug and play integration with laptop and desktop computers. AIS350’s dual channel receiver architecture rapidly acquires both Class A and Class B targets and continues to update them more rapidly than previous generation receive-only units. This is particularly important when tracking fast-moving Class B vessels like speedboats, small commercial powerboats, and small fast ferries.